Being pregnant is exciting as well as exhausting due to hormones, food cravings, mood swings, heartburn and being unable to sleep because of your growing belly. 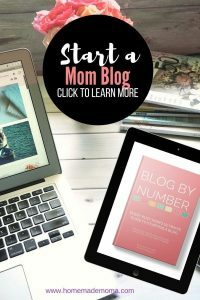 I have a few great ways that will help you figure out how to sleep when your pregnant and be comfortable. Lets face it this is about the only time you will have uninterrupted sleep if this is your first baby or if your kids are sleeping through the night so it is important to get what you can before baby arrives! I have two children and one I had a harder time getting sleep but the other I was able to find comfortable ways to compensate for my ever growing belly and get more sleep than before. I will share with you some tips and tricks and what works best! 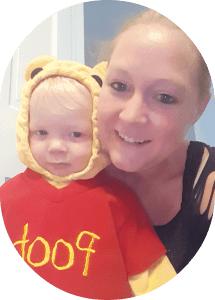 Some positions may not work for you it all depends on how your baby is laying and your belly plus those fun things like heartburn and restless leg syndrome but I’m sure you will find something that will work wonders for you. Here are the best ways to sleep when your pregnant, some are my own and some I found through a lot of research. I will also share with you a secret that worked great for me!!! Pillows are going to be your friend for most of your pregnancy! Thank God for pillows really without them I’m not sure how pregnant women would make it through without freaking out at some point in those many months. I would have no clue how to sleep when pregnant if this were true. In your first trimester it may not be so difficult to sleep but if it is probably due to heartburn (like I so happily had to endure both times) try laying on your left side this will help keep the acids in your stomach from coming up your throat. Either side works, if your right is more comfortable try sleeping on it especially if you are used to sleeping on this side then it will probably be more comfortable for you. This is okay for the first trimester and then after that it is recommended to sleep on your left side for better blood flow and nutrition for your baby. Laying on your side with a pillow between your legs helps relieve back pain and support your belly at the same time which will help you fall asleep faster in your third trimester and hopefully make you feel more comfortable. If you have swollen feet put a pillow under them to raise them up while you sleep. These are awesome!!! If you haven’t heard of it or how it works it is a pillow made just for pregnant mommas like you that wraps around your body supporting your back and belly and promotes great sleep all night long (minus the bathroom breaks every few hours). They work amazingly well and I recommend getting one if you are able to. They aren’t very expensive and so worth the money and I absolutely Love them!! I’m a stomach sleeper and it is hard for me to sleep on my side all the time so a super great trick I did was to put a pillow under one of my legs usually my right one and then lay on my stomach with the pillow keeping my weight off of my belly. 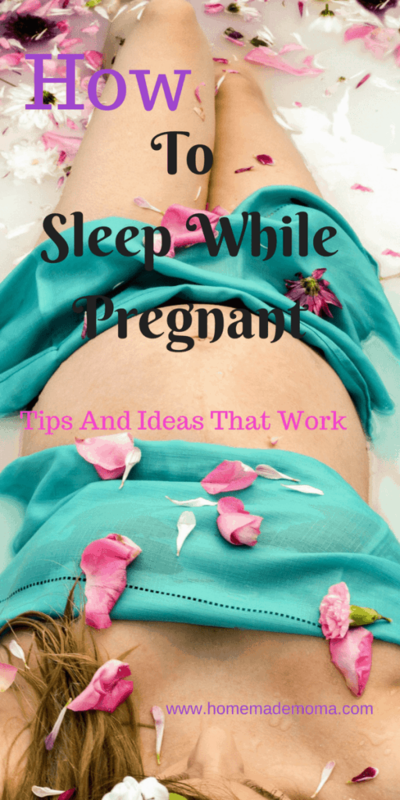 This is one of my best tips how to sleep when pregnant and it works! Sounds kinda weird but don’t knock it till you try it! I got great sleep this way for a long time and never felt like I was squishing my baby. When this doesn’t work for you any more get the pregnancy pillow and I guarantee you will sleep great at the end of your pregnancy. Here are some tips of how to get better sleep during your pregnancy broken down for you by trimester and the solutions for these challenges. Super tired all the time along with nausea and body pains which all can cause major problems when it comes to getting the sleep you need. Tired All The Time– A few tricks I have found that work are to take naps in the afternoon if possible for an hour or two so that you can sleep well at night other wise you may lay there and not be able to sleep due to being overly tired at this point. Body Aches And Pain-You will probably experience cramping and soreness or tender breasts and sometimes your body hurts because it is starting to make room for baby. What I recommend is to go for a walk in the evening to help clear your mind and stretch those muscles and also take Tylenol if you need to help with the pain. Taking a bath helps also as long as the water isn’t really hot as this is not good for the baby and can raise it’s temperature to much. Morning Sickness-Feeling sick can happen at any time so it is a good idea to prepare for this at bedtime for late at night or morning help just keep some saltine or some kind of crackers there to settle your stomach. I actually used goldfish crackers but whatever you prefer works great! Some women have used peppermints, candy, ginger or motion sickness bracelets to help with severe sickness! The second trimester is a little better depending on what you do for work you may not be tired like in the first trimester, hopefully if your lucky you won’t have morning sickness and body aches still but for some you can have these all along. You should be able to sleep better at this time (use my little trick to sleep on your belly if you sleep well this way) except for the heartburn that you may or may not have had in the beginning. Heartburn– For this try laying on your left side or on your stomach with a pillow with your right leg supported so you are kinda on your left side. If this doesn’t work I do have a trick that worked for me because my heartburn was so so bad. Take a spoonful of baking soda in a glass of water like a short cup size glass and drink it. Seriously this works amazingly well, I didn’t believe my friend Joyce when she said to try it but I was desperate and it worked awesome so give it a try!! You won’t be disappointed, also you can try to prop your head up more at night and don’t go to sleep right after eating wait an hour or two before going to bed. Vivid Dreams– You may find that your dreams seem to be more real and detailed and you can remember them I believe this is due to your sleep pattern being interrupted by those frequent trips to the bathroom that you will be making. A way to solve this problem is to cut down on fluids a few hours before bed so that you don’t make those trips to the bathroom as often if at all. This is the longest trimester it seems just due to how uncomfortable you are but you are almost there so hang on mommy I have more tips for you to help with the Restless leg syndrome, back pain, frequent urination leg cramps and congestion. RLS-Is something that happens to some pregnant women a study of over 600 women found that 16% had this and what it does is makes you feel like your legs are itchy or have pins and needles this can happen at night and keep you from sleeping well. Taking supplements like Iron, magnesium, vitamin B12, or folate. Also stretch the legs or use hot or cold packs as well as warm baths. Back Pain-Lay on your left side and have a pillow between your legs or use a pregnancy pillow this will help alleviate the pressure being put on your back due to the extra weight you are carrying in the front. Frequent Urination-Try not to drink a lot of water about two hours before bed time this will help cut down on the bathroom trips throughout the night. Leg Cramps-These can be caused by not drinking enough water and also from all of the changes your body is going through so some cramping is normal. You can try a warm bath to help soothe the muscles as well as some Tylenol to help with the pain and bananas, sometimes the loss of potassium has a hand in this. Congestion-This is super common when pregnant because of the constricting of the vessels in the nose causing you to be congested all the time. It is most annoying I know and the one thing I found that helps is a humidifier at night and using a nose spray called Xlear it helps to clear out your nose and help you breathe better and the only spray I have found that is all natural that even my two year old can use it. Love this stuff!! Just remember at the end of all this comfortableness is a beautiful baby and it is all so worth it but in the meantime use these tips and techniques to get better sleep during your pregnancy and be more comfortable! I recommend that you invest in the pregnancy pillow and get some Xlear for your congestion I guarantee you will not regret getting either of these items they are a life saver and will make you more comfortable and right now comfort is hard to come by. Hang in there momma I know it’s hard but it will be over soon I promise and then you can hold your beautiful little one and forget how miserable you were! Pin this post to Pinterest for reference!!!! Spot on with this write-up, I truly think this web site needs much more consideration. I’ll in all probably be reading this post once more to learn far more, thanks for that info! Thanks for visiting my site, so glad that you found this post helpful!! I am a stomach sleeper – thank you for this post!!! So helpful. It’s hard to be pregnant and not be able to lay on your stomach to sleep when that is the way you always slept. So glad you found this post to be helpful!! I have become a light sleeper, and apparently my husband snores. Now we are battling it out. Why should I be forced from my bed at night? And I’m sore and sensitive. I’m so sorry you are dealing with this. I had the same problem with my husband when I was pregnant and the only way around it is to go to sleep before him and maybe try ear plugs. The breathe right nose strips work really well too, if he is willing to wear them.